This week's featured artist is Leila of Illustrated Ink and Tatoo Tales. 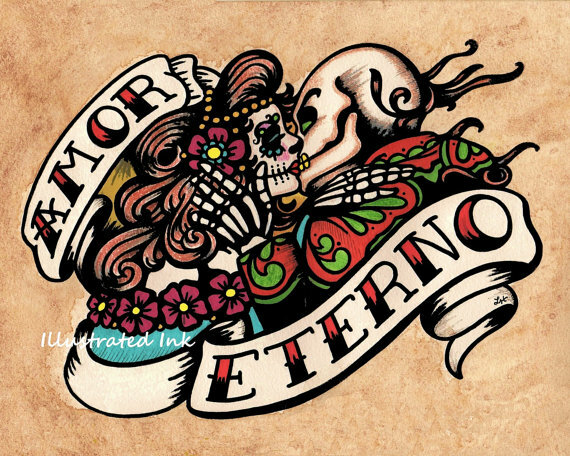 I am an admirer of Dia de Los Muertos art in a huge way. One of my favorite searches on Etsy as a matter of fact. When I found Leila's art, I was truly in love. 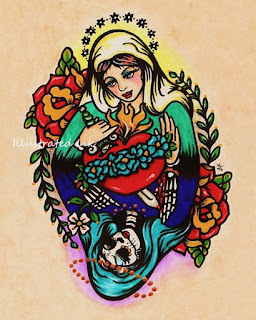 Her "back in the day" tattoo artistry combined with an obvious love and passion for Day of the Dead art is so apparent in every piece she completes. I have a few of her illustrations and they have a place as part of my ofrenda for celebration of Day of the Dead as well as decorating my work space every day. 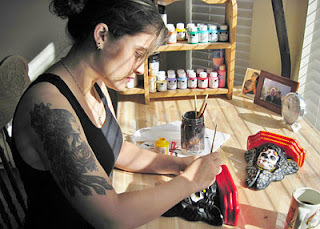 There is a sincere homage to both tatoo and Dia in every piece I have seen that is created by this very talented lady. I invite you go to visit Leila at both her Etsy shop and her blog. You'll get to see not only her art but also the newest member of her family, Edward the adorable Corgy puppy. His little face is soooooooo sweet. Thanks Leila for being my featured artist this week. On my way to visit Laila. I love this colorful skully expressions! Thanks for introducing Leila...what great stuff she makes!! She's a gal right up my ally and am going to "sheck" her out. Linda, I love Leila's art! I went to her store, and those skeleton cats melted my heart! Beautiful! Have a great day! Ooooo, I love that first one especially! Now I'm off to check out her store.